Eating your daily allotment of greens is SO easy with this recipe. It literally uses one entire pound of spinach! Free free to mix and match other greens like kale and mustard greens too (I made this last night with spinach and kale). I love this Instant Pot recipe because the cooking is done with no need for supervision, which means you can close the lid and forget it! This recipe can be made with paneer which is a firm Indian cheese. We found it at Wegman's, our local grocery. You could also use tofu, though I would recommend cutting it into squares and baking it until it's a bit more dry. This is a great mild way to introduce some new flavors to your family, with many healthful spices included in this recipe (and not much heat). Spices like turmeric have well documented health effects. To save money on some of the spices, look for them in larger packages in the Indian store or near the Indian/ethnic section of your grocery store and use them over many months (freeze for even longer use). Serve this with rice or dip some fresh naan bread into it. Heat 1/2 tablespoon of oil on sauté mode. Once heated add paneer and toss until a bit golden (skip this step if you are using tofu). 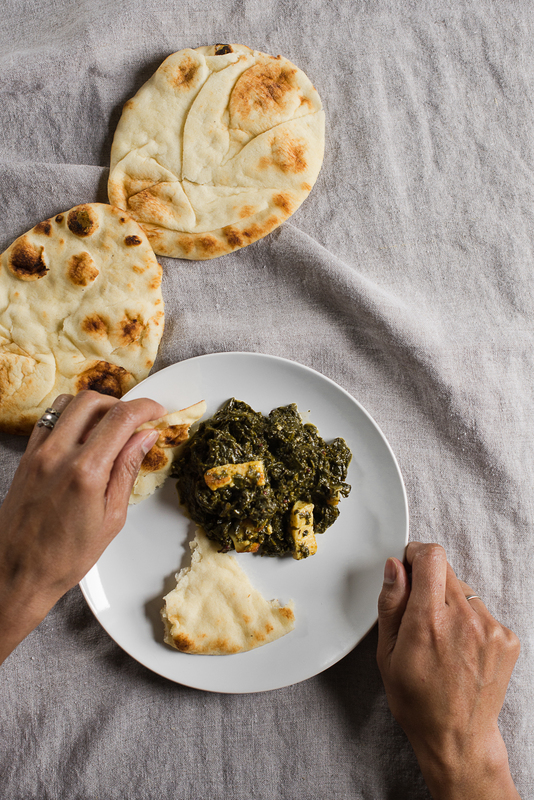 Remove paneer and set aside. Add the other 1/2 tablespoon of oil and then cook onions, pepper, garlic and ginger, until fragrant, about 3-4 minutes. Add mustard seeds, coriander, cumin salt, pepper, turmeric, and crushed red pepper (optional). Add tomatoes and mix throughly. Place the chopped spinach into the Instant Pot and stir to wilt so there is enough room. Once all of the greens are added, use the "Poutry Setting" to cook for 15 minutes. Do a quick release and then if there is a little extra liquid, place on "Saute" for a few minutes to cook of the excess. Add back the paneer and stir until warmed through. Leave out the hot spices (hot peppers and crushed red pepper) for a great babyfood with interesting new flavors. Use some of the liquid to blend to a smooth consistency for the newest eater.